One of the biggest telecom industry challenges is distribution. Networks are a huge, fixed cost to pay for, so there’s great pressure to maximize network usage and the revenue that flows from that usage. And even though a telecom creates dozens of services to drive that usage, the high cost of promotion puts practical limits on the number of markets you can advertise to and support directly. This is precisely where virtual operators come in. If a reseller spends its own money promoting a network operator’s wares, both parties benefit. The reseller makes a profit and the network operator earns revenue in markets it can‘t profitably reach on its own. In theory, the more virtual operators the merrier were it not for the high cost of administering and supporting these virtual operators, particularly on the product side. Now, reselling plain vanilla mobile minutes through an MVNO is relatively straightforward. The problem comes when you resell products like content, applications, web hosting, and cloud services. These complex products require you to set various parameters and manage other details that -- if not done right -- can easily “break” a service and cause customer care nightmares. There’s another distribution challenge as well: resellers want the freedom to create and price their own service bundles, but enabling such a high degree of product catalog flexibility at the reseller level is a pretty tall order. Well, where there’s a will, there’s a way. Rob Hill, a product manager at Clarity in Australia, is here to explain some of the details behind a remarkable new product called Marketplace, an active catalog with customization capability and workflow engines to support dozens — even hundreds — of resellers underneath it. Dan Baker Rob, to start it would be great if you explained what this Marketplace product does in a nutshell. First, it’s a full-fledged active catalog that enables an operator to get new and innovative products and services to market quickly and inexpensively. I define an “active catalog” as a system that combines catalog and order management functionality so services can be defined alongside the very processes used to provision and manage them. It’s about creating re-usable components for future products, something telecoms have dreamed about having for a long time. Now the second mission of the platform is to bring this service creation environment to each and every reseller in an operator’s ecosystem. It manages products not just for two-level, wholesale/reseller relationships, but for multiple levels of resellers. And Marketplace extends this functionality to each of these resellers in the supply-chain. 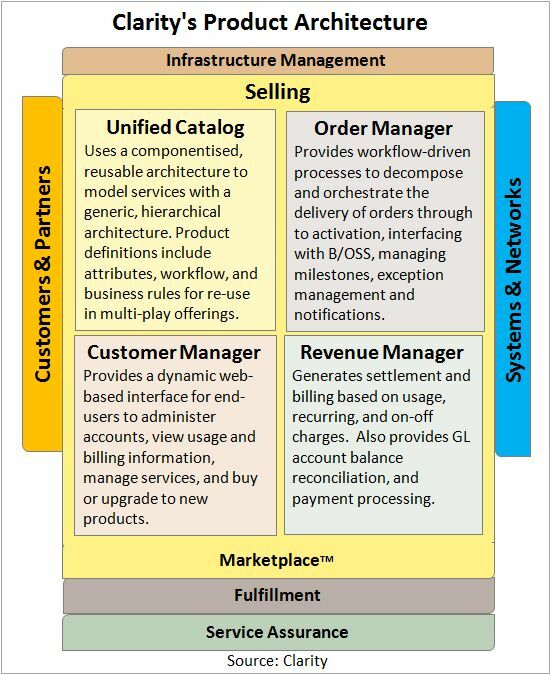 Marketplace not only supports a deep hierarchy of resellers, it allows you to model complex partner interactions between organizations that are not part of a wholesale/resale relationship. So at the top level you can plug in, say, a CPE equipment that is supplied to a wholesaler. Then, that wholesaler is free to use the CPE as part of the bundled services it offers to resellers. Our previous platform maintained a strict hierarchy, but we’ve since removed that constraint so that it’s now possible to create ad-hoc business relationships. For instance, a wholesaler may allow one of their resellers to start selling OTT services to another of their resellers — whilst taking a per-click fee for every transaction. The idea is to not confine how the operators interact with the system. The wholesaler obviously wants to control the products offered to its own resellers, but the wholesaler doesn‘t have time to keep track of the details and options for each product, so it makes sense for resellers and wholesalers to basically access product catalog information directly. That relieves the wholesaler of doing a lot of administrative tasks in support of the reseller. Sounds like Marketplace had to be designed with a lot of flexibility in mind. How was that achieved? Actually. portions of our Marketplace system have been available for some time, having evolved over the past seven or eight years. Our key learning from these years of experience was that organizations needed the capability to get new products and services to market as quickly and reliably as possible. Long development and integration cycles were a big no-no. So all customer business logic had to be easily managed outside of the core platform -- by the customer. And the product and service structure had to be flexible enough to represent the today’s complex offerings as well as those on the drawing board. So that’s what we did. We use a common platform and GUI to create new services that the operator sells to its resellers. But the reseller gets the same flexibility to add their own OTT services and/or adapt the products it receives for its own market. That’s the power of the platform — resellers can innovate around the core services being provided by the telco, driving revenue and broadening the overall wholesale footprint. In times past, we had to issue a new product release whenever a customer needed to add a new core service. That’s no longer required because the business logic stands outside the core, meaning customers are free add their own value onto their product offerings and not be tied to the software development cycles within Clarity. Essentially, everybody in the supply chain gets their own virtual service creation environment, but they only see the service components that their supplier or wholesaler exposes to them. So if you are a wholesaler, you are releasing and configuring products for your resellers. Now to do that, it’s important that the wholesaler be able to maintain its own product versions and be able to roll those back. That functionality extends down to the resellers as well. So, at each layer you can tightly control product changes and get those products out to market quickly. Clarity’s core competency has always been around the provisioning and service assurance functions, but where does the revenue management side of telco partnering reside in your system? Does a third party vendor supply that? Since we manage the catalog that each provider in the chain, we have all the rating information attached to those product offerings. So, when some end customer buys from a retailer whose bundle is composed of components from wholesalers and so on, we track each of these transactions. If you are buying a product, you will see what you bought, when you bought it, and how much it costs. Now in terms of sophisticated usage-based billing, we don‘t currently offer that capability, but in our solution set we have mediation through an OEM relationship with Digital Route. So we are keeping our options open. At some point, we may want to offer a fuller billing system as part of our portfolio. Tell us about one of your key clients for Marketplace, TelstraClear out of New Zealand. Sure Dan, TelstraClear is New Zealand’s second-largest telecom and is a wholly owned subsidiary of Vodafone New Zealand, with around 400,000 customers. The company provides residential line, internet, IT services, security services, cable TV/cable modem and mobile phones. TelstraClear uses Marketplace to manage over 40 distinct virtual service providers on the same platform, with each provider in its own white-label “virtual sandbox”, which ensures that there is no visibility or interaction between these distinct organisations. Let’s walk through an example of how a reseller would modify a product. It begins when the reseller takes one of TelstraClear’s core services such as ADSL 2+. The reseller offers the ADSL 2+ service to its end user customers, charging a specific amount per MB of bandwidth consumed. These charges are configured by TelstraClear. Now let’s say the operator needs to counter a price challenge made by a competitor. They decide to make a change, offering their end-customers a base amount of bandwidth at no charge, then charge a slight premium rate once they exceed this amount. Marketplace allows them to make these threshold and charging modifications to their version of the core TelstraClear service. And this is all done by the reseller via a secure web-based interface to the platform. Currently there are over 300 distinct packages based on 27 core products in the product catalog, some created by TelstraClear, the rest created and managed by TelstraClear’s reseller customers. How does the user create new services business processes in the system? First of all, the Marketplace functionality isn‘t a side show. It does its work in the big tent. When the platform user models operational processes while maintaining full integration with the backend B/OSS chain that supports it -- provisioning, service assurance, trouble ticketing, etc. For every service modeled, you create from one to maybe 10 different workflows that manage the deployment, activation, or the other tasks associated with a service component. It handles the service from cradle to grave — creation of the service to its ultimate retirement at the end of its life cycle. Wholesalers, resellers — anybody who touches the system -- can graphically drag and drop business processes process to describe the flow of the service. Those processes could be anything from modeling the automated steps that happen from a network fault alarm to day-to-day manual processes such as the end user customer’s sign-up form on the web. At a large telco, you have different business units, such as enterprise, consumer, and wholesale who need to coordinate and offer service to each other. Yes, and Marketplace can enable these internal supply chains as well. For instance, each of the internal departments can have their own catalog related to the types of services they are offering to the rest of the company. There is lot of process and security around that so that the products and services they expose can only be changed within particular parameters that they themselves set. They can also assign costs so that someone in product management has the information he needs to configure products with various components and understand overall costs. So it’s not only about architecting a particular business division’s services but architecting those services so another division can reuse the service later on. Thanks for the nice briefing, Rob. Can you sum up for us the value proposition for Marketplace.? Thanks, Dan. Marketplace is about extending traditional telco supply chains. It allows wholesalers and retailers to easily include OTT products in their offerings and significantly lowers the barrier for resellers by extending core functionality to these resellers. It makes everybody in the chain more efficient, informed and able to make changes to their own offerings. That seller could be the reseller of the original wholesaler, a reseller of the reseller, and so on. 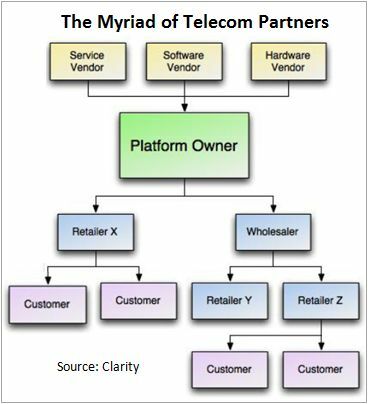 While the Marketplace platform is sold to one telecom, its effect is to make that telecom’s internal operation and entire partner ecosystem more effective.